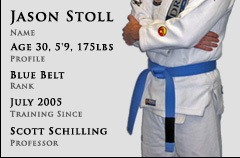 After class tonight I had a quick chat with one of the senior blue belts of our team, Jason. I was explaining how I would prefer being swept to give me opponent top mount because I can escape bottom mount easier than passing a tight closed guard... I have been spending a great deal of time developing my Upa. Jason pointed out the flaw in my logic of giving up position the "easy" way; "Would you like to be on the bottom of a mount on the street?" and "If you compete, getting mount is worth 4 points." He was right, of course. Rolling is a fun game of chess, but every class I start taking "the game" a little more seriously. And this is where habits come into play. If I develop bad habits, they will cause me great problems moving forward. Having the senior belts and Professor Schilling make corrections to my learning and training, from the theory to details, will make be a better fighter and perhaps a good teacher in the future. We all know that a bad habit is hard to break, well, so is a good one. Being a white belt and listening, really listening, and constantly trying to form good habits is probably the most important thing in developing in Brazilian Jiu Jitsu. Good habits. I have to start working very hard on my guard passes; not my favourite thing, but that I think is a good habit to develop moving forward. And keeping what I earn... Another good habit. P.S. In class tonight, Professor Schilling mentioned two books we should pick up; The Gift of Fear and Protecting the Gift by Gavin De Becker. I am a father of 13 month old son, and his safety, as well as my wife's, are always on my mind. I will be picking up the Protecting the Gift book next time I am at the book store, or perhaps the library ;).